This new handset is similar to the Axon Pro, offering additional features like a fingerprint reader and microSD support, but also having a lower resolution screen and less memory. 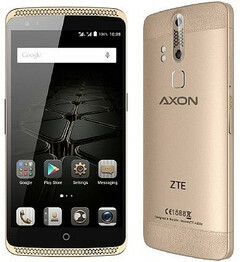 Described by Android Central as "ZTE's most premium smartphone to date," the Axon Elite is a slightly different ZTE Axon Pro. Compared to its sibling, it comes with leather trim on top and bottom, less memory and internal storage, but also has a microSD slot and a fingerprint scanner. In addition to the fingerprint sensor, ZTE Axon Elite also features an eye sensor and voice unlocking. The handset will go on sale in Europe later this month for around 465 USD, with more markets to follow in October. ZTE Axon Elite is now present at IFA and can be found at Hall 25, Stand 105 at the Berlin ExpoCenter City. We will get back to it as soon as we hear news about its price and availability in North America, so stay tuned.